The Stoplight Parrotfish is a common Caribbean algae eater. This fish has a strong beak that resembles a parrot's beak, which is how this fish gets its name. 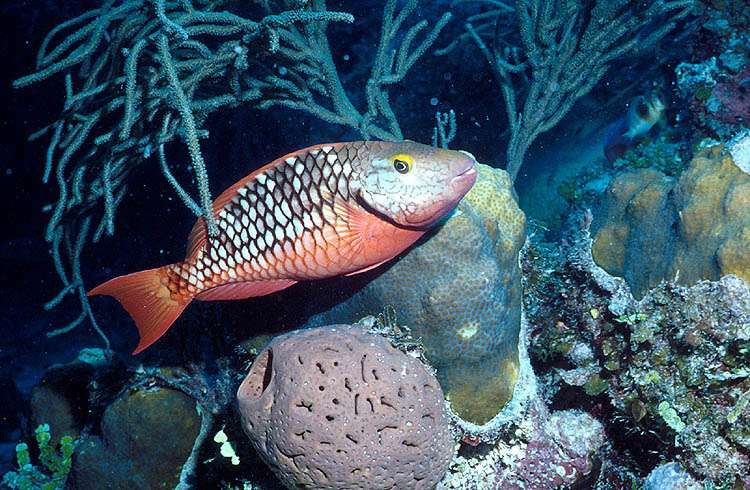 The Stoplight Parrotfish will scrape algae from the surface of the reef. The sound of the scraping is so loud that you can hear it when you swim nearby underwater! Too much algae threatens corals. If the conditions are right for algae to grow, then the algae can grow over the reef if there aren't enough algae eaters like this Stoplight Parrotfish to eat them. There needs to be a healthy abundance of algae eaters to keep the corals healthy. Click here to learn more about the Stoplight Parrotfish and how this fish can make sand!